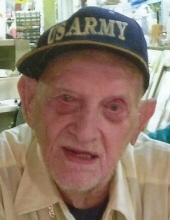 Samuel G. F. Gaugler, 97 years, formerly of Allentown, died Thursday, March 21st, 2019 at his residence at Whitehall Manor. Born in Coopersburg, he was a son of the late Samuel and Elizabeth (Moll) Gaugler. Sam worked for many years as a laborer for the Lehigh Dye and Package company before retiring. He is a WWII Army veteran who served in the 214th Infantry in the European-African-Middle Eastern Theater. Sam enjoyed drawing and playing the harmonica. He is survived by his children; daughter-in-law; granddaughter; great grandchildren and sisters Ruth and Judy. He was preceded in death by his son, brothers and sisters. Funeral services will be held at 11am Tuesday March 26th, 2019 at Brubaker Funeral Home, Inc. 234 Walnut St. Catasauqua, 18032. His viewing will be from 10-11am Tuesday at the funeral home. Interment to follow at Fairview Cemetery in Whitehall. Memorial contributions may be made in his name to Heartland Hospice, 881 Marcon Blvd #3700, Allentown, PA 18109. To plant a tree in memory of Samuel G.F. Gaugler, please visit our Tribute Store. "Email Address" would like to share the life celebration of Samuel G.F. Gaugler. Click on the "link" to go to share a favorite memory or leave a condolence message for the family.